This time of year always feels like a checkpoint to me – it reminds me of the always-fun adventure of figuring out this whole adulting thing on my own for the first time as a newly minted grad. In honour of that, here are the five things that would have made my life a lot easier if I had known them in those fresh new grad days when I was, in all honesty, probably more stressed out than I ever have been since. You are likely making the lowest salary of your career right now. So as much as you need to be responsible with it, and live within your means, and all that jazz – be gentle with yourself. It can be really stressful when you think about all the things you want to do, and accomplish, and pay for in some way, shape or form. Maybe it’s travel, or retirement savings, or a wedding, or a house, but for now, take a deep breath. You have time. You will get there. Don’t kill yourself trying to reach all of those goals at the same time. Give yourself some breathing room. It’s really – really – tempting to let newfound income go to your head. And fun story, this applies just as much to any eventual raises as it does to the transition from student to earning-an-actual-income. But barring a few really significant raises you might score in your life, the jump from being a student to earning a full-time income is one of the biggest jumps in income you’ll probably experience. Pay attention to the recurring payments you’re adding to your life. When you join a fancy gym, or take on a new subscription, or commit to a weekly class, or add a daily latte to your life, just be aware of it – and watch out for how they add up. I am a great example of how quickly these kind of things can get out of hand, because when I went to look at my monthly recurring payments, I ended up saving over $1000 by cancelling services I didn’t even need. And for the love of all things money, don’t lease a brand-new luxury car, especially if you can get by with public transportation. Save something for your mid-life crisis. Make sure you allocate money to savings. The best way to safeguard against levelling up to a lifestyle you really can’t afford is to make sure you’re putting aside a portion of your money towards your savings goals. Start with a small emergency fund, and build towards other goals from there – if you ever get fired or end up between contract jobs, an emergency fund will make it way, way better. Even if you’re spending the rest of your money, that buffer going into savings is the best way to make sure you’re not living beyond your means. And pay off your credit card. Every month. Yes, you might be making a ton more money than you ever have before, but be careful. Just because it’s more than you’ve ever been used to before, doesn’t mean that you necessarily know what kind of lifestyle it can really support. $40K feels like a lot when you’re used to funding an entire school year on less than $10K, but when you’re making big decisions – like where to live, and how you’ll get around – make sure that you’re not overshooting what your salary can realistically support. 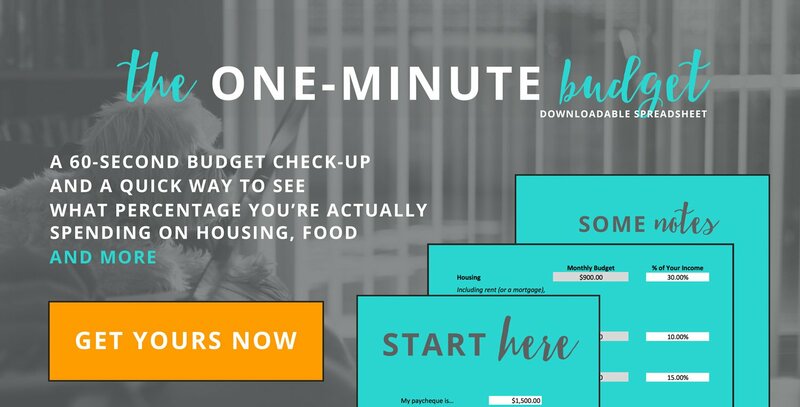 A great way to check is to do a quick One-Minute Budget. It’s a (free!) 60-second way to see how your income breaks down based on popular budget ratios – like only spending 30% of your income on housing, for example. Honestly, I wish I had a tool like this when I got my first paycheque – if only to tell me I was probably being too aggressive with my savings goals on such a teeny income, and maybe to relax a little. It’s also adjustable, so you can move the ratios around to suit your priorities, from buying really great food to paying down debt aggressively. But as you do that, you’ll see other categories have to drop, which is the best budgeting lesson I’ve ever learned. You can’t afford everything, but you can afford some things. Make sure they’re the ones that matter to you. For me, the most stressful thing about transitioning from being a student to earning a full time income was that my income was – all of a sudden – totally set for the month. There were a set number of dollars that were mine to spend, and when they were gone, they were gone. It turns out, this doesn’t have to be true. Because it’s true. Just because you have a full time job, it doesn’t mean you’re in any way above picking up a few part-time shifts, or even better, starting up your own side hustle or business. I’m not going to get into too much detail here, because there are about a billion great side hustle articles out there on the internet. But seriously – if you’re in any way as stressed as I was about balancing your full-time income with all of your goals, you can earn more money. It’s an option, and one I wish I had taken more seriously when I graduated. I had a fun realization the other day. My monthly spending – the total amount of money that goes out the door to fund my housing, my car, The Dog, and general life expenses (ahem patio beers) – is hovering only a few hundred dollars below my total take-home pay at my first job. They could afford it because they were spending all of their money. They certainly weren’t saving as much as I was, and being really strict with themselves to accomplish it. I know, because now, my monthly spending to afford those things is in some months, exactly what I was taking home at my first job monthly. So I could have – technically – supported the lifestyle I have now with that new-grad salary. But when I got fired, I wouldn’t have had the emergency fund that made everything so much better. I also wouldn’t have been able to buy Little Car outright when I moved to the suburbs, and I certainly wouldn’t have the retirement savings and investments I have right now. Those were the right choices for me, then and now, even given how much I worried about it. And, if I’m being perfectly honest, how much I envied my peers who didn’t worry about it. If I could go back, I’d tell myself that I would accomplish the things I really wanted (mostly, getting a dog) in time, and not to worry how fast or slow everyone else was getting there. I’d tell myself to just focus on taking the steps that were available to me at the time, and enjoy – or at least tolerate – the process. I’d also tell myself to focus on what my priorities were, and to let everyone else figure out theirs. But then again, I’d also go around telling everyone I knew to start an emergency fund yesterday, and how much to save in it… So maybe they can figure out everything after that on their own. And I’d probably also remind them one more time that the One-Minute Budget is the best thing you can do for your money in under 60 seconds, and that you can get it right here. Great advice, Des! And awesome tool! I think the biggest downfall for a lot of grads is being so young and just not being able to wrap your head around how old you need to be before you have your whole dream life sorted out. I used to have a small business (wedding related) that I started when I was 15, and imagined a completely different scenario for that path by the time I turned 25. I’m just over 2 months away from hitting 25, and I am definitely nowhere near owning my own wedding venue, so go figure. Oh man, YES TO THIS. I was so surprised that I wasn’t (insert everything I ever thought an adult would be / do / have) by 25. Like, what? I don’t have a dog yet?! What the hell am I doing all this adulting for if I don’t even have a dog yet? Hahaha but in all seriousness, it’s true – I think everyone should take a collective breath that it will all happen in its own time, and to cut ourselves some slack on the timeline thing. Awesome advice, Rue! These are all really great pieces of advice! But, the new grads that are likely to be reading this post will probably be much more financially aware than I was at the time, so I have no doubt that they will already have a handle on these things. Haha I mean, I read Moneysense and all kinds of budgeting books and I STILL needed to hear all this, so I’m sure any and all advice is a good reminder! Honestly, I *was* even told some of this, several times – especially the “you have time” thing – but it was so easy to feel like it didn’t apply to my specific situation. Which, in hindsight, makes me just like every special snowflake millennial, haha. I wish I had listened better, regardless of how much I knew or was exposed to personal finance! Love this, especially #4. I was a business student in college, and while they constantly stressed the fact that you should diversify your investments, they never put too much emphasis that you should diversify your income as well. Having one source of income is great, but if you can supplement that with other sources as well, it makes a huge impact. Best thing is, it doesn’t have to be anything major – tutor a few nights a week. Rent out a room in your home. Use your skills to freelance. These are the things that will fast track you to financial stability. You can only slash your expenses so much, but the amount of income you can earn is limitless. Oh man, TOTALLY – I did business as well, and the WHOLE focus was Getting A Job after school. One job, full time – or entrepreneurship, also full time. No one really talks about balancing the two, and the ways you can make money on the side or get real, valuable experience running a small business. (As a marketer, you had better believe running this blog is a resume line item for me!) Dear business schools: talk about this stuff! To my new grad self I would say watch the high tech sector. Wait till your in your thirties before building a house and, yes, you really do need to plan out decades ahead if you want financial comfort in your old age. I’m quite proud of your writing style my girl. This is fun and informative. Awwww thanks Mom! I learned from the best – aka you! And you totally did tell me all of this and more as I new grad – sorry it took me so long to get the “calm down, you have time and it will get better” message! Love you! I love the idea of relaxing and taking things slowly. As an impatient person, I still struggle with this. I would also tell recent grads to follow their passions while paying attention to their finances. Life is too short to only be motivated by money. Plus, if you can figure out your passions at a young age, you can use them to unlock a lot of opportunities and fulfillment that some adults are still searching for. Totally! And it’s so true – figuring out what you love to do and working on it now, even if it’s on the side at first, is so important. I know too many people who are burning out way too early (like, before 30.) There is 100% something you like doing and a way you can make money doing it – start exploring! I rented too much house, bought a big screen TV and a car I could not afford. I married an abusive man because I thought I “should” . This led to many sleepless nights, divorce, and more poverty. So much yes to budget guidelines as well - that's close to what I used in the One Minute Budget and that's really why I built it. It's too easy to never see what a SUPER quick budget breakdown should look like, and even if it's nothing close to what your budget really looks like, it can be a great "oh wow" moment. TOTALLY – I’m glad I’m not the only one who wanted to go Full Adult (or, more accurately, Full Consumer) right away when I graduated! As tough as it was to balance everything with my new-grad salary, I’m glad for the frugality it semi-imposed on my life so I didn’t go nuts. I guarantee that had I graduated into a higher salary, I’d have nothing more to show for it than I did after a few years in my “student” apartment with its questionable-origin-story futon for a couch. True story: I only replaced that futon when I got out of a long term relationship and started dating as “an adult” because I felt like adults in the world wanted to date other adults who had not-the-worst-couch-in-the-world. How bad was this futon? My mom sewed together five old pillows from Value Village to use as cushioning to make it sit-on-able and I think because she pitied me. There is totally a post in here somewhere, haha. Great list! I think #5 is huge. There is always going to be a friend that makes more than you and saves more than you, just get over it. This used to be hard for me when I was very career driven. I make a good income now, but coming to terms with the fact that someone will always be ahead in the financial game can be a hard pill to swallow – especially if you’re competitive. Definitely! And it’s all about the choices you’re making – it’s just sooooo much easier to see “fancy new car” and not “financial freedom at a young age” or “flexibility for one partner to stay at home” or “even has an emergency fund at all.” That’s why it’s so important to focus on the only complete picture you have, which is yours. If only I had learned that a little sooner, haha. I like that you balance responsibility out with experience. At 22-23, just out of college, people are in MUCH different headspaces than they are even five years later. Yes saving and living within your means is important at that age, but you’re a brand new adult! You want to try things! You want to say yes where before you had to say no! You have to be flexible with finances. That’s just life. I think setting savings goals young, being financially literate and flexible gives the best tool kit to new grads. I think I would tell myself everything you have said above! I think the last one is really important – not worrying about what other people are doing – as what they are doing may not necessarily be the best thing over long term. I will be attempting to drum this all into my daughter when she is older! Probably all of this. I went backpacking through Europe right after graduating university. I still did a bit more travelling when while I was broke. When I got my first job, I went on two more trips within the year. Yes, I really do like travelling. Lol. I would tell my new grad self to start investing and saving right away, even if it’s only $25 or $50/month, it will eventually add up.